Shipments are sent via FedEx Overnight and will arrive by approximately 4pm the next day. Saturday deliveries will incur an additional $20 delivery charge. No deliveries on Sunday, Monday, or Holidays. Shipment(s) do not require a signature or to be home at time of delivery. Lobsters should be cooked the day they are received. Recipients will receive cooking instructions and suggestions for the care of their live lobsters. Please order next day deliveries by 1pm. Deliveries are not available Sunday, Monday, Holidays and the day after a Holiday. Saturday service is not available in all areas If you have questions or concerns or to order by phone, please contact us at 1-207-994-3179. Shipments are sent via FedEx Overnight and will arrive by approximately 4pm the next day. Saturday deliveries will incur an additional $20 delivery charge. Shipments do not require a signature or to be home at the time of delivery. Lobsters should be cooked the day they are received. Recipients will receive cooking instructions and suggestions for the care of their live lobsters. Maine Ocean Lobster offers Flat Rate Shipping and Saturday Delivery. Order as many lobsters as needed with NO increase in shipping. 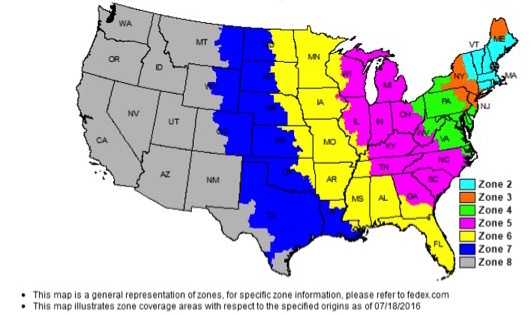 Your zone will be determined by zip code during checkout. *Guaranteed to arrive alive and kicking!